The Network’s tribal collaboration team has taken major steps since its development in the summer of 2016. The team, along with collaborators and leaders across the region, have worked to expand Extension collaborative programming and partnership among state and tribal land-grant institutions by strengthening learning from local successes, researching ideas for future collaboration, and identifying future joint funding opportunities. In 2017, the team convened the first North Central Tribal Water Summit at Haskell Indian Nation University in Lawrence, Kansas, which brought together Tribal Colleges and Universities (TCUs) alongside state land-grants to identify priority issues surrounding water, share past collaboration successes and challenges, and determine future funding and collaboration opportunities. Then in Spring of 2018, the team conducted a survey examining the level of interest in specific workgroups. The survey addressed the priority water-related issues identified in 2017, as well as the types of partnerships that would be of interest and the kinds of water-related collaborations currently taking place throughout the North Central Region. The online survey was distributed to faculty, administrators, and Extension personnel from state and tribal land-grants, and individuals who work for state, federal or tribal agencies who are interested in collaboration. Over 130 survey responses were received. Results showed the vast majority of the respondents were somewhat to very likely to attend a face-to-face conference in 2018 to build upon the 2017 summit. Moreover, survey results demonstrated an overwhelming interest in the collaborative workgroups focusing on a range of priority issues from watershed assessments and agricultural best management practices to local foods and water and emergency preparedness for tribal communities. On average over 35 individuals have signed up for each of the six proposed workgroups via the survey. 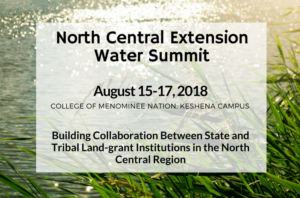 With these survey results, and the important connections established at the 2017 Tribal Water Summit to build on, the project team has planned a follow-up summit, which will be held August 15th through August 17th at the College of Menominee Nation, Keshena Campus in Wisconsin. With the help of project leader, Charlie Barden of Kansas State University, NCRWN director, Rebecca Power, and support from a plethora of state land-grant and TCU professionals, the summit will highlight current collaborative projects and shared priorities that emerged from the survey, educate participants on a diversity of mutual water-related topics, and create actionable plans and goals for each of the six workgroups. Registration for the summit is now open. State and tribal land-grant, Extension, and agency professionals interested in collaboration are encouraged to attend. Limited travel assistance is available for tribal college representatives interested in attending. The first 50 registrants will receive complimentary lodging at the Menominee Casino resort. Visit http://northcentralwater.org/tribal/ for agenda and registration information and addition information on the tribal collaboration team. Early registration ends July 13th.